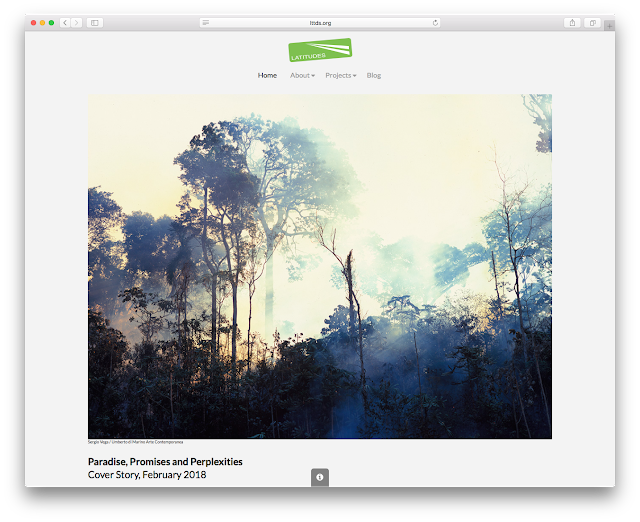 The February 2018 Monthly Cover Story "Paradise, Promises and Perplexities" is now up on www.lttds.org – after this month it will be archived here. El Ayuntamiento de Barcelona convoca anualmente los Premios Ciudad de Barcelona con el objetivo de premiar la creación, la investigación y la producción de calidad realizada en Barcelona por creadores o colectivos, instituciones y organizaciones barcelonesas. 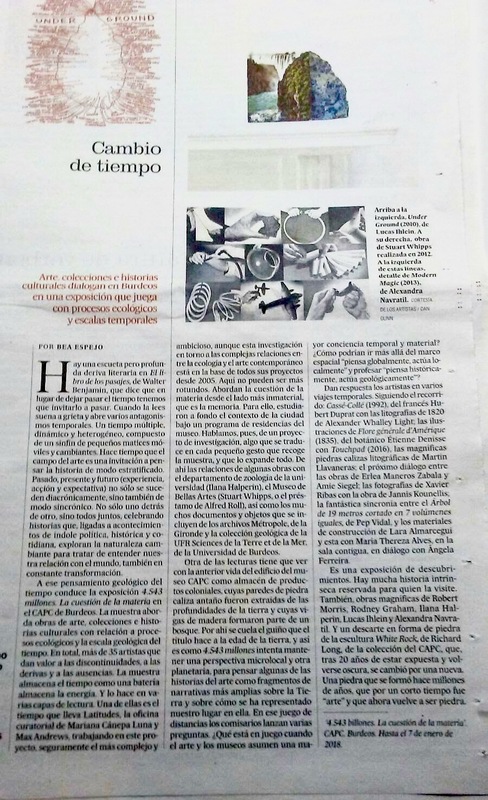 El Instituto de cultura de Barcelona (ICUB), encargado de la organización de los Premios, profundiza en la dimensión ciudadana de estos galardones al reconocer el talento de otros ciudadanos -los ganadores. Los miembros del jurado son propuestos por el Consejo de la Cultura de Barcelona y nombrados por la Alcaldesa Ada Colau. ‘Por un año de excepcional calidad que ha resultado en el proyecto de vídeo «Cos Social [Lliçó d’anatomia]» presentado por LOOP Barcelona en el Arts Santa Mònica, en una coproducción con la Xarxa de Centres d’Arts Visuals de Catalunya, y en la performance «Tour de Force», una coproducción del CCCB y la Fundació Han Nefkens, en el marco de la exposición «1000 m2 de desig. Arquitectura i sexualitat»’. Joan Morey fotografiado por Marc Medina. Otros jurados – véase sección "About"
As the ‘4.543 billion. 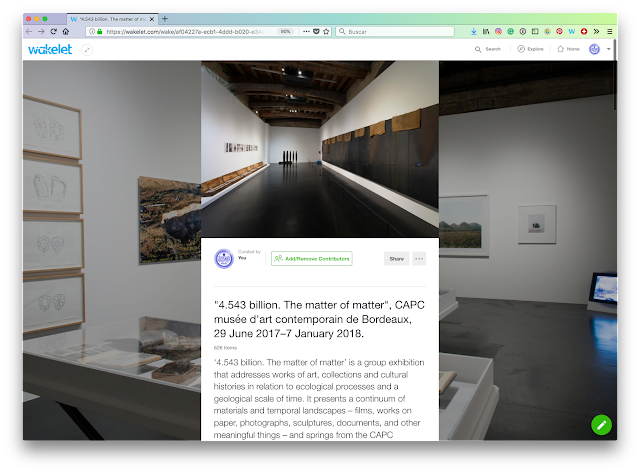 The matter of matter’ exhibition concluded on January 7, 2018, at the CAPC musée in Bordeaux, we finished archiving all the social media posts visitors, the museum and ourselves have published – see our Wakelet feed below – since research phase to the exhibition itself, and below share the most relevant print and online reviews. Wakelet collection of the "4.543 billion" exhibition. December 8, 2017: Tom Jeffreys highlighted the exhibition in his "Looking Back: Paris" roundup for frieze magazine – illustrated with two works included in the show by Nicholas Mangan and Alexandra Navratil. 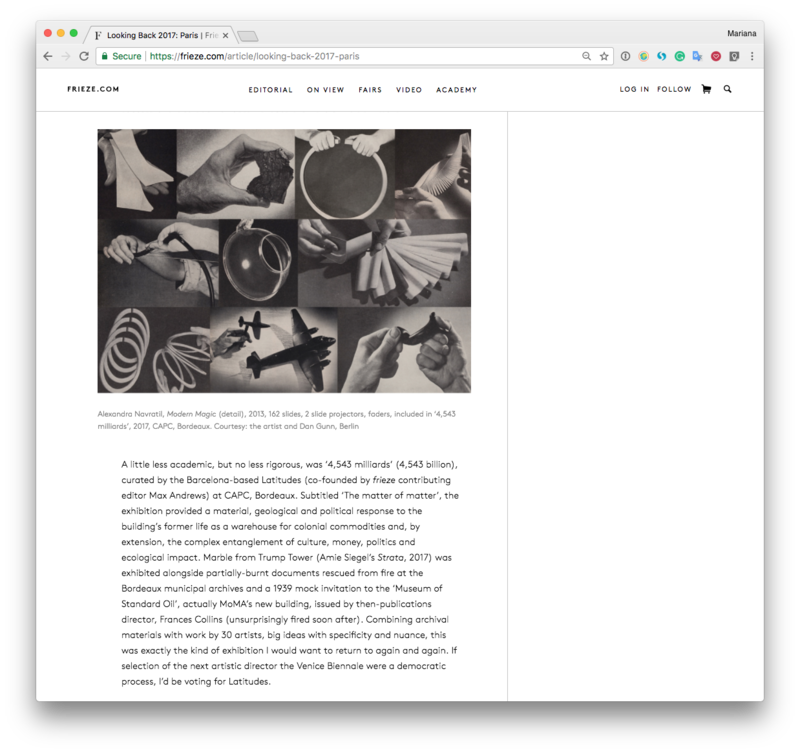 "A little less academic, but no less rigorous, was ‘4,543 milliards’ (4,543 billion), curated by the Barcelona-based Latitudes (co-founded by frieze contributing editor Max Andrews) at CAPC, Bordeaux. 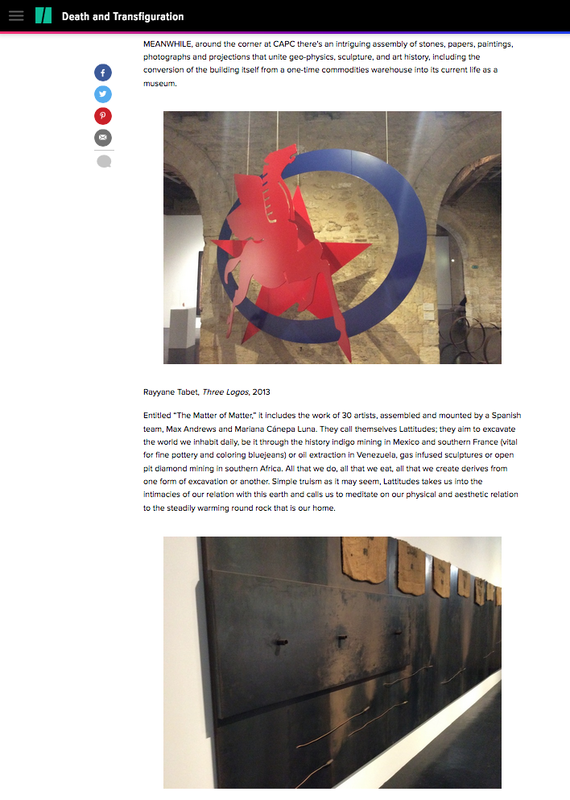 Subtitled ‘The matter of matter’, the exhibition provided a material, geological and political response to the building’s former life as a warehouse for colonial commodities and, by extension, the complex entanglement of culture, money, politics and ecological impact. Marble from Trump Tower (Amie Siegel’s "Strata", 2017) was exhibited alongside partially-burnt documents rescued from a fire at the Bordeaux municipal archives and a 1939 mock invitation to the ‘Museum of Standard Oil’, actually MoMA’s new building, issued by the then-publications director, Frances Collins (unsurprisingly fired soon after). Combining archival materials with work by 30 artists, big ideas with specificity and nuance, this was exactly the kind of exhibition I would want to return to again and again. 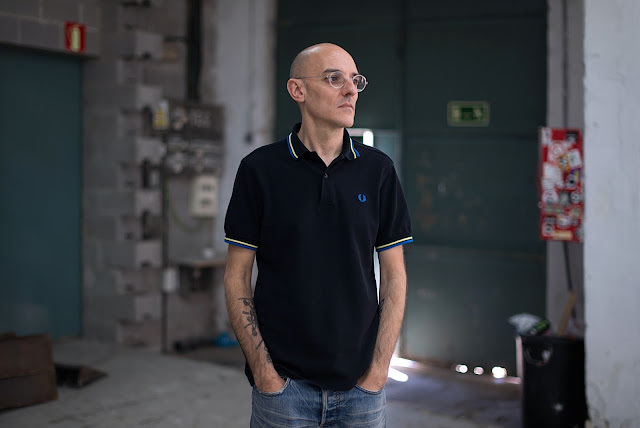 If the selection of the next artistic director the Venice Biennale were a democratic process, I’d be voting for Latitudes." "Meanwhile, around the corner at CAPC there’s an intriguing assembly of stones, papers, paintings, photographs and projections that unite geo-physics, sculpture, and art history, including the conversion of the building itself from a one-time commodities warehouse into its current life as a museum. Entitled “The Matter of Matter,” [missing "4.543 billion" years, the age of the Earth, and the first part of the exhibition title] it includes the work of 30 artists, assembled and mounted by a Spanish team, Max Andrews and Mariana Cánepa Luna. They call themselves Latitudes [wrongly published with two "T"]; they aim to excavate the world we inhabit daily, be it through the history indigo mining in Mexico and southern France (vital for fine pottery and coloring bluejeans) or oil extraction in Venezuela, gas infused sculptures or open pit diamond mining in southern Africa. All that we do, all that we eat, all that we create derives from one form of excavation or another. Simple truism as it may seem, Latitudes takes us into the intimacies of our relation with this earth and calls us to meditate on our physical and aesthetic relation to the steadily warming round rock that is our home." 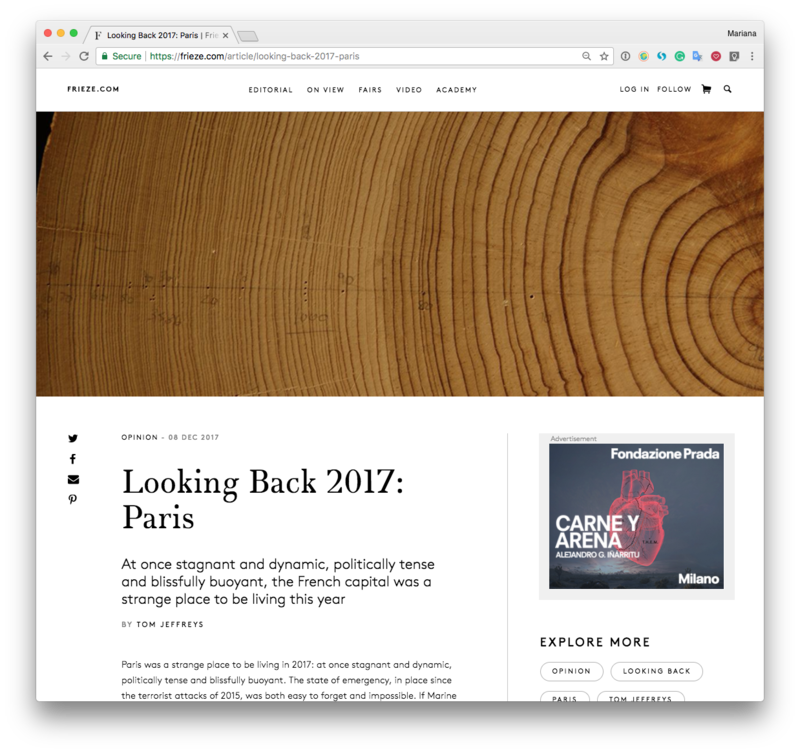 September 20, 2017: Emmanuel Labails of RCF Radio did a 9-minute interview with Pedro Jiménez Morras, Head of Press of CAPC, who discussed the premises of the exhibition and some of its works. (Listen between minute 4:39 and 13:36). 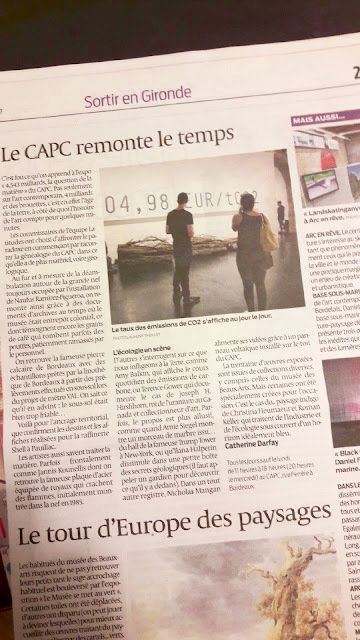 July 12, 2017: Catherine Darfay's ‘Le CAPC remonte le temps’ on the local newspaper "Sudouest", was the first feature. The article was illustrated with a with an image showing Amy Balkin's ‘Today’s CO2 Spot Price’ (2009) chartering the daily price of carbon dioxide emissions allowances in the world’s largest carbon market —a changing value documented in this blog post. Archive of social networks posts related to "4.543 billion"